Just when you think you’ve seen practically every gadget imaginable on Coolest Gadgets, the Cat’s Arse Sharpener pops up to tickle your imagination. This twisted take on an everyday office object will definitely have its fair share of detractors the moment they lay their eyes on it. This white, plastic cat comes with an erect tail and a surprised look (I would too, if I were in its position) due to the fact that the only way you would be getting your pencils sharpened would be by stuffing the blunt end into its arse. Can you say ouch? I suppose after getting over the initial shock of placing your pencils inside its arse to be sharpened, you will have to brace yourself to listen to it meow as it starts to sharpen your writing instrument. The litter tray at the bottom is there for a very good reason – to collect all the bits and pieces of your pencil shavings. 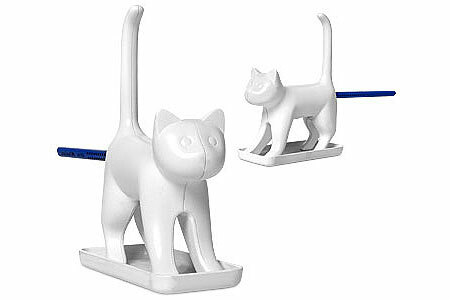 While not many people use pencils these days, the very existence of a Cat’s Arse Pencil Sharpener literally justifies the purchase of pencils if just to hear it meow. Not only pencils are able to benefit from this unique sharpener, but crayons as well. Since crayons come in a traditionally fat form factor, you would need to purchase those with a diameter no larger than the average pencil. Suitable for those aged 16 and above for obvious reasons (imagine the physical trauma of the younger ones using this – worse still, they might even try the same thing on a real cat that would result in horrendous injuries to the child), the Cat’s Arse Pencil Sharpener measures 15cm x 12cm x 14cm and retails for £6.95.